city’s major thoroughfares, became the site of a number of activities, drawing Panaji’s citizens together during the early hours of the day, to take a stand for the cause of inclusive streets and sustainable modes of commuting. This event was the ‘One Planet Streets for All’ initiative – a public event organised by the Corporation of the City of Panaji in association with WWF-India (World Wide Fund for Nature) and supported by ICLEI-South Asia (International Council for Local Environmental Initiatives), aimed towards the goal of ‘sustainable mobility’. Sustainable mobility refers to modes of mobility that do not negatively impact the environment, the promotion of which is one of the major goals of the WWF globally, and WWF-India nationally. One Planet Streets for All is a major aspect of this goal – it represents the belief that roads are public infrastructure, and that everybody has an equal right to use them, irrespective of their mode of transport, be it pedestrians on foot or private car owners. According to the WWF, mobility accounts for about one-quarter of the global energy-related carbon dioxide emissions, a major cause of air pollution, with much of this occurring in cities. Furthermore, as per the 2017 Global Burden of Disease, approximately 1.1 million people in India die prematurely each year, from diseases directly related to air pollution, thereby making it the fifth leading cause of death in the country. In Goa, as the organizers of the event point out, more than 90% of the total number of registered vehicles in the state are privately owned, thereby making Goa one of the states with the highest car ownership density in the country. All other possible modes of commuting such as walking, cycling, car-pooling and so on are recreationally used, but are not the primary choice for mobility among citizens, largely due to the fact that the space meant for more sustainable modes of mobility are either encroached upon or reduced due to the increasing pressure of private vehicles. It is clear that promotion of sustainable mobility is the need of the hour. But to bring about sustainable urban mobility, a shift in mindset appears to be required, in which people would let private motorized vehicle-use give way to sustainable transport modes and better lifestyle choices, including the use of public transport, cycling, walking or car-pooling. The direction of One Planet Streets for All is to this end – to raise awareness and mobilize support from the citizens of the state toward smart and eco-friendly mobility choices. To inspire them to give up on unsustainable modes of commuting, in order to reduce their carbon footprint. To address mobility and safety concerns for pedestrians and cyclists. And to ask the city administration to adopt practices that would help make Goa environment-friendly and sustainable in the long run. With registrations beginning at 6.30 am on May 6, the three-hour event One Planet Streets for All included a range of activities which involved all interested citizens, from the youngest to the oldest, and which held one thing in common – geared towards encouraging sustainable mobility. While the cyclathon promoted cycling as sustainable mobility, walking too was represented –a special walk around the Mandovi was organised by the Charles Correah Foundation and led by Noah Fernandes, during which time participants learned about the history of the city in terms of its development around the river. “Rather than merely getting people to walk aimlessly, we wanted to make it more interesting and purposeful, with Noah giving them insight into the history and heritage of this city that has sprung up around the Mandovi river,” adds Saritha. Other activities included a session on Ashtanga Yoga conducted by Geetanjali Lobo, as well as a karate demonstration by Sensei Joseph Rodrigues and his students, who arrived at the venue Campal Gardens in an appropriately sustainable manner – on bicycles. The demonstration was followed by a workshop on women’s self-defence. Bookworm Goa, the children’s library, was there to provide both entertainment and awareness to kids, with games like ‘Books Snakes & Ladders’, and on the spot reading opportunities. ‘Move n Seek’, a game on sustainable initiatives from around the world, was organised by Incollab. This isn’t the first time the citizens of Panaji have taken over the streets for an environmental cause. 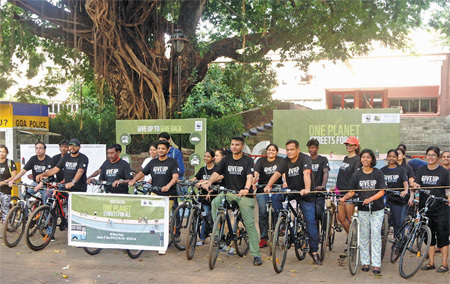 The One Planet Streets for All initiative is in a sense, a successor to the NoMoZo initiative organized in Panjim city a few years ago, that had garnered plenty of attention – an initiative in which every Sunday for a few weeks would see certain streets of Panjim turn into ‘No-Mo-Zos’ (Non-Motorized Zones). The streets were cordoned off to vehicular traffic, allowing pedestrian traffic alone, and providing a space for citizens to come together to mingle, play, and engage in a number of collective activities. Ideated by a citizens’ group called Aamchi Panaji, working in collaboration with the CCP, the goal of NoMoZo was to address the issue of traffic congestion in Panaji, and to educate citizens that the solution to it is the promotion of more sustainable modes of transportation through the development of public transport, dedicated cycle lanes and pedestrian paths. One Planet Streets for All came about for a very similar purpose – geared towards making the city of Panaji more environment-friendly. Having witnessed wide participation by Panaji’s citizens, young and old, the organisers seem confident that the city is getting on track towards the global goal of sustainable mobility, that will benefit both citizens individually, and the planet on a more global scale.